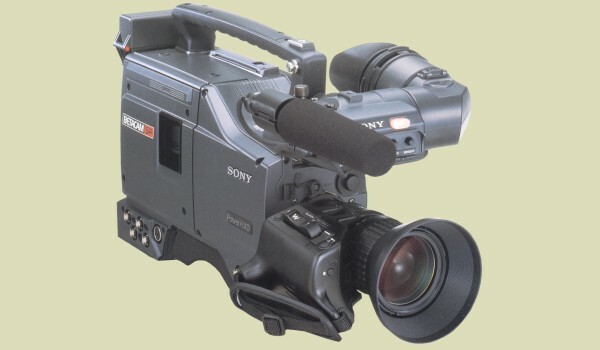 The UVW-100 is a single camera/recorder unit based on Betacam technology. It was designed for programme acquisition in all areas but has been particularly popular in ENG (Electronic News Gathering) work. It's weight of 7.3kg, enabling single person operation, has no doubt added to its success. The UVW-100 features a compact design and incorporates a small drum mechanism. It has low power consumption (20W) and uses the familiar NP-B1 battery. It is equipped with a LTC (Longitudinal Time Code Reader) and is genlock-able to external time code which mean it is suitable for use in a multi-camera environment as well as single camera work. It also has an industry standard 26-pin interface allowing component and Y/C signals to be fed directly to another VTR. Audio input is via balanced XLR connectors, and in keeping with all UVW series models Dolby C noise reduction is used to enhance audio performance. The VCL-714, 14 x zoom lens was fitted as standard along with the DXF-601 viewfinder.